I shared on my Instagram the other day that I’m realizing my favorite part about motherhood is after baby is born – though I love pregnancy, I’m more a fan of baby being out than in for 9 months! Luckily, I had an awesome wardrobe to grow into thanks to Pink Blush Maternity – my go-to boutique for maternity and postpartum clothing – which made dressing the bump so much fun! They made it super easy to dress stylish while staying comfortable throughout each trimester, and I could not be more grateful to have had such a gorgeous line of maternity clothing to choose from while pregnant with our second! I would describe my style as bold, as I love to mix color + texture + pattern. Pink Blush has a ton of great wardrobe options to mix and match neutral with bold, color with pattern, and comfort with style. One of my favorite things about this outfit is that I can style these overalls so many different ways! I’ve dressed them up with wedges and an off the shoulder flutter sleeve top for dinner, dressed them down with white converse + a graphic tee + baseball cap for errands, and then styled them like this ^ for a more elevated casual look that is perfect for a girl’s brunch date. When you’re trying to dress the bump, style can sometimes feel pushed to the back burner. Let’s be real – who doesn’t want to be in stretchy leggings and a tee every day during the third trimester?! Luckily, Pink Blush has so many options for maternity that definitely don’t lack in the style department…and can be easily worn postpartum too (my favorite!). I’ve loved being an ambassador for this brand, as I’ve found a ton of super comfy AND stylish wardrobe pieces that fit every area of my lifestyle throughout pregnancy and postpartum. The straps on these overalls extend generously, which was really convenient for growing with my bump. The side buttons gave me a lot of extra wiggle room too! Baby girl #2 has been sitting super low the majority of my pregnancy, so I definitely needed the extra space by my lower belly to feel comfortable. Dresses have definitely been more of my go-to for my second pregnancy, mainly because my body shape is a lot different than it was during my first pregnancy – meaning, my normal pants and shorts stopped fitting while I was still in my first trimester. Dresses are super easy and comfortable to wear during pregnancy, and can be dressed up or down with just accessories alone. To elevate my look a bit, I will usually throw a wide brimmed hat on or a jean jacket with statement earrings. I hardly have time to do my hair anymore, so wearing a hat with a low bun makes it look like I’m more put together than I’m actually feeling haha! I love this maxi dress for the color and the print. I’m always hunting for bold wardrobe pieces, like this one! My favorite part about this dress is that it’s a faux wrap – normal wrap dresses I’ve found are harder to wear while pregnant because the wrap part doesn’t always sit right (or even fit) the further along you are in pregnancy. This neckline is loose enough to pull down to nurse, and the waistline sits high enough to flatter and comfortably fit a bump. And how fun is it that this maxi has pockets?! 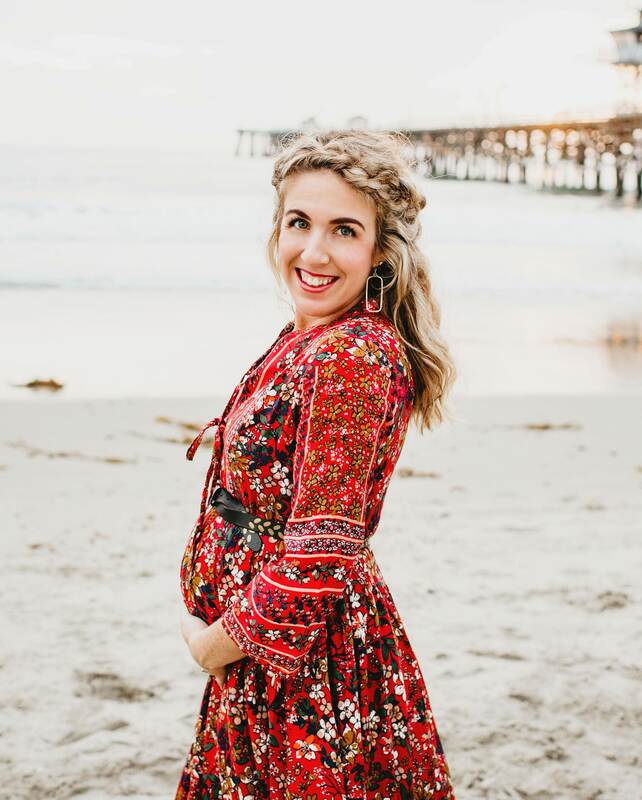 If you are a fan of wrap dresses and are expecting a baby bump this spring, make sure you check out Pink Blush’s spring line of maternity wrap dresses 🙂 I love that they’re focusing on brights and florals this season.